People try to predict all kinds of things, from the weather to football scores -- all with mixed results. Predictions of one phenomenon are usually pretty accurate: the tides. But getting it right requires good information about many factors. The tides are caused by the gravitational pull of the Sun and Moon, which create “bulges” of water in the oceans. As these bulges move around Earth, they run into land, causing the water level to rise and fall. So the most important factors in predicting the tides are the positions of the Sun and Moon -- their distance from Earth, their direction in space, and how they’re moving. But the most accurate predictions require even more. Forecasters need to know the contours of the seafloor, for example. That’s especially important in bays, where the rising tide can be funneled into narrow channels, producing big swings in the water level. Forecasters also need to know weather conditions, because winds and air pressure can affect the water level, too. 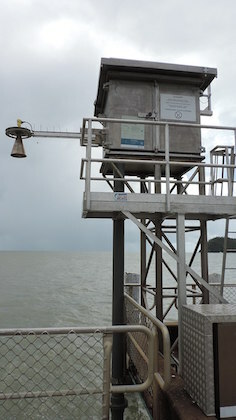 Forecasters monitor the tides with special gauges. In the past, the gauges used pens that recorded the rise and fall of the tides on strips of paper. Today, they use GPS, radar, and other tools. All of the information is fed into computers. They use models of the different factors that influence the tides to predict the times and levels of high and low tides. In some places, they also predict the strength of the tidal currents -- keeping coastal interests well informed on the ebb and flow of the tides.